These Crispy Baked Chicken Wings are a healthier alternative to the classic fried boneless wings. 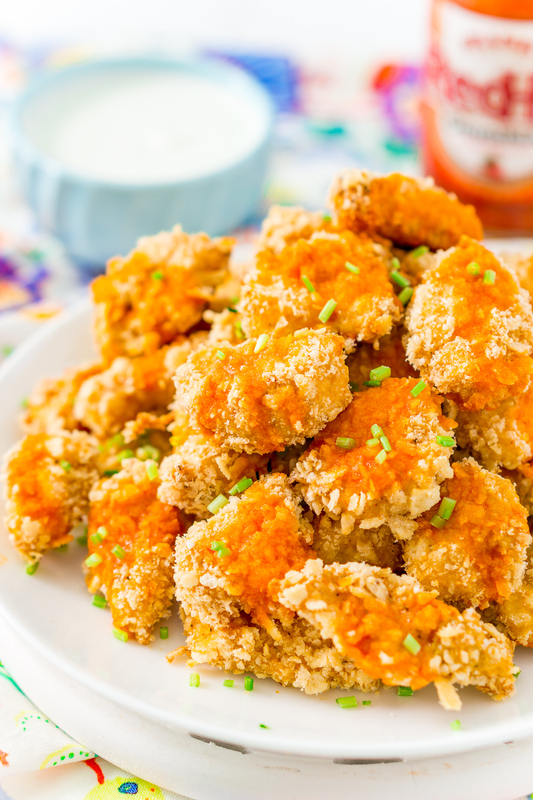 Easy to make, and drizzled with a homemade Buffalo sauce for a punch of flavor! 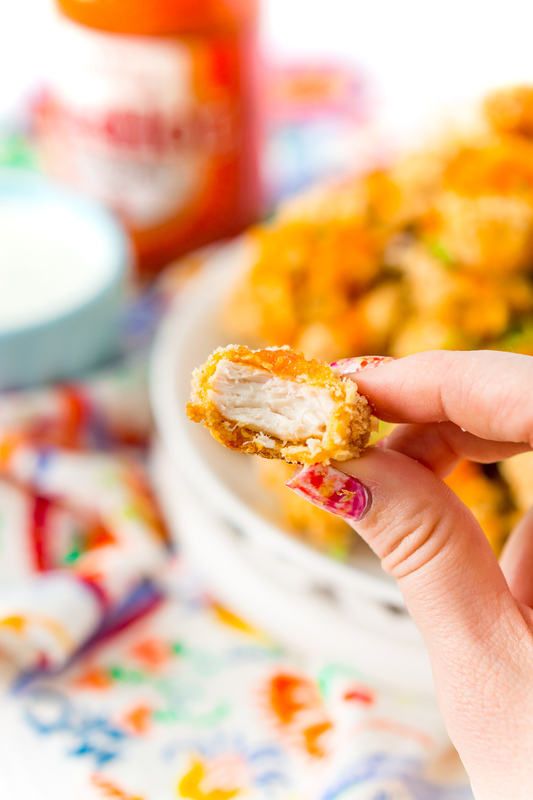 If you’re a sucker for chicken wings or tenders, you’re going to go crazy for these Crispy Baked Chicken Wings! Made with a special coating, these Oven Baked Wings have lots of crunch without being fried. Matt and I are big fans of boneless wings (or anything Buffalo), but we usually only enjoy them when we go out to eat. 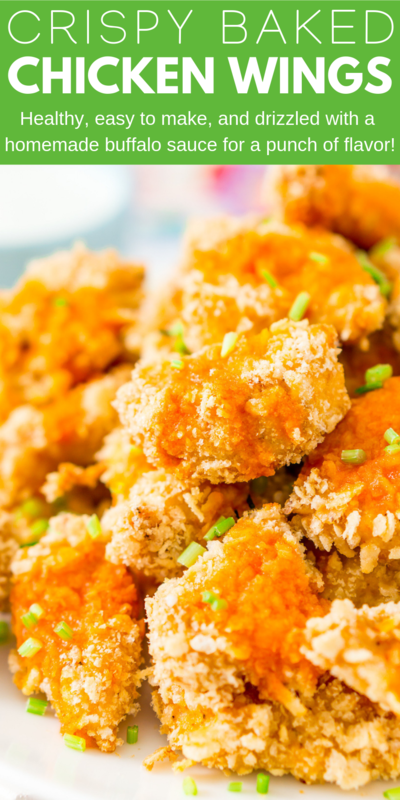 Which is why we love this Crispy Oven Baked Chicken Wings Recipe! Baked Buffalo Wings are crunchy on the outside, juicy on the inside, and covered in tangy sauce and zesty spices. Trust me, they’ll make you forget all about the frier! 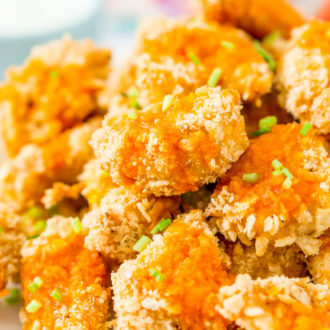 The secret to the scrumptious texture is the coating, which is made with crushed tortilla chips and crispy rice cereal. That’s right: when ground in a food processor, these two ingredients create a mixture that’s flavorful and wonderfully salty. 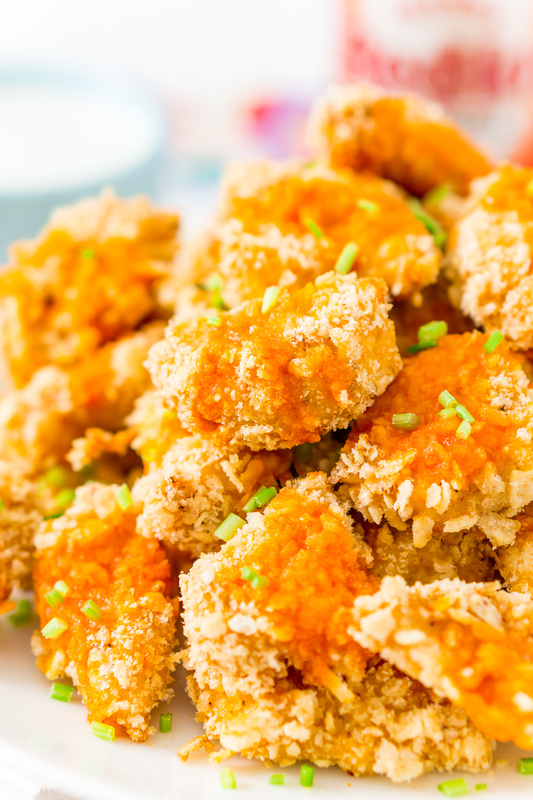 The chicken chunks are coated in flour and spices, dredged in an egg wash, then rolled in those tasty crumbs before baking. 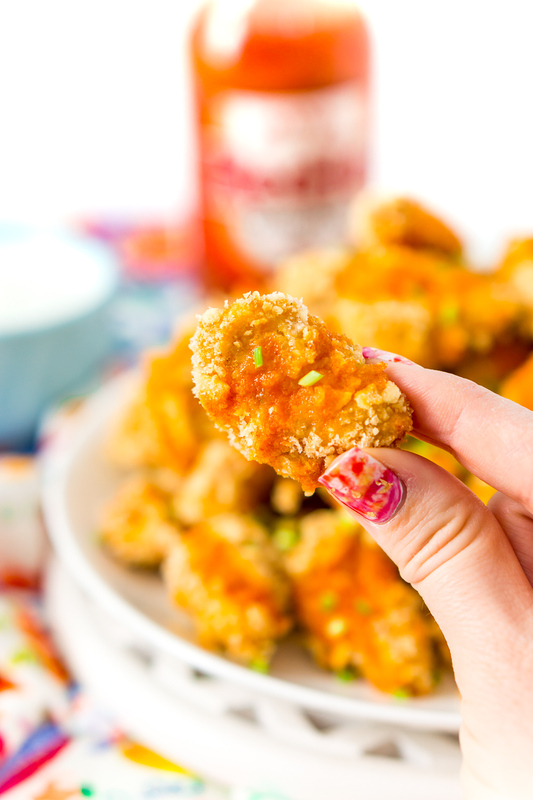 Last, these Oven Baked Wings are drizzled in that tangy homemade Buffalo sauce. Or you can keep them plain if you want! How do you make Buffalo sauce, you ask? 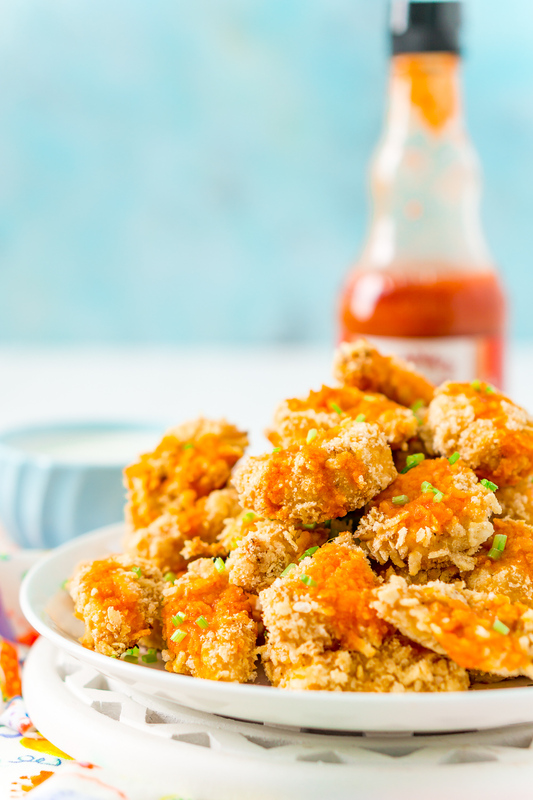 Technically, Buffalo sauce is just a blend of hot sauce and butter, but this recipe takes it a little further in flavor! A little butter, some hot sauce, a spoonful of apple cider vinegar, and a hint of honey does the trick! When you make Chicken Wings In Oven, you can enjoy them any night of the week. In my house, we often make a meal out of these, but they also make hearty, tasty snacks! If you have kids with ravenous friends, try making a batch or two of these Oven Baked Wings to satisfy hunger. These are also perfect for potlucks or casual get-togethers, plus I have two more words for you: GAME DAY! And let’s not forget, these Healthy Chicken Wings mean way less guilt. If you really want to be good, try adding a handful of tenders to a bowl of greens. With a drizzle of bleu cheese or ranch dressing (low fat, of course), it makes a killer salad! Spend less money and savor more flavor with these Crispy Baked Chicken Wings. Perfect for any occasion, they’ll definitely become a family favorite! Preheat the oven to 375 degrees F and line a large baking sheet with parchment paper. Spray with cooking spray and set aside. Add the tortillas chips and the rice cereal to a food processor and process into crumbs. Pour into a medium bowl and set aside. In a small bowl, whisk the eggs and set aside. Add the flour, cayenne pepper, garlic powder, onion powder, ground pepper, and salt to a gallon Ziploc bag, shake to mix and set aside. Prepare the chicken by cutting into approximately 24 small chunks that are roughly the same size. Add the chicken to the bag with the seasonings and shake to coat. Work in an assembly line to take the floured pieces one by one and dip them in the beaten egg, then coat them in the crumb mixture. Shake off any excess during each step, then place on the baking sheet 1 inch apart. While the wings are cooking, whisk together the sauce ingredients. When the wings come out of the oven, drizzle the sauce over them. Serve with ranch or blue cheese dressing, if desired.